In this blog we will demonstrate how to create an interactive share button with a simple "READ_MORE" as our call-to-action. See live demo near the bottom of this article. This is the prompt when the user clicks on your share button. This is shown after the OAuth consent dialog. This also shows the call-to-action "Read More" button (Click on image to enlarge). 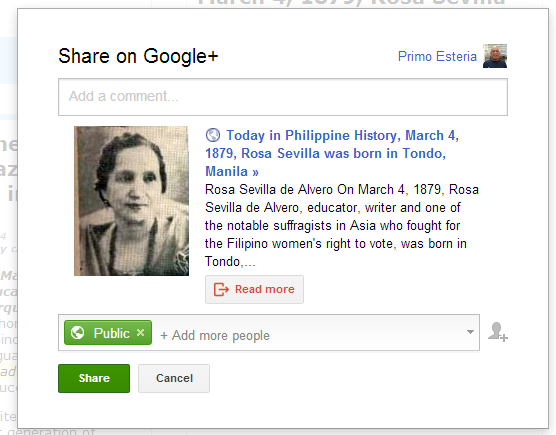 Here is how the interactive share post looks like in the Google+ stream. Notice the "Read More" button. That is the added call-to- action button (click on image to enlarge). Then add the HTML markup where you want the button to appear in the page. Use either a div, span or button. data-prefilltext="This is the initial comment of the post"
Class g-interactivepost is required whether you are using span, div, or button. igc_share is our custom style for our button, see further down below for details of this class. data-clientid is what you created earlier from the API console. This is a required attribute. data-contenturl is the content of the post. This is what appears on the Google+ stream. This is similar to the standard shared post. This is a required attribute. data-cookiepolicy. See here for determining the value of data-cookiepolicy. This is also a required attribute. data-calltoactionlabel is the call to action button that appears below the text preview of the posted item (data-contenturl). In our example, we used READ_MORE. The default is OPEN, it also goes to default if what you specified cannot be identified. According to Google+, this label is translated to user's language. See the interactive post page for complete of list of possible values. data-calltoactionurl - is the URL of the data-calltoactionlabel. The domain name specified here should match with that of the data-contenturl. In our example, since we are only using READ_MORE, this points to the same URL of the data-contenturl. data-prefilltext - This is the initial comment to the post. data-approvalprompt - This can either be auto or force. When force is used, the OAuth consent dialog is always shown when user click on the button. See the Google+ interactive post page for complete list of button attributes. Below is the CSS style we used for our button. In designing your button, it is recommended to follow Google+ branding guidelines. Below is a live demo. 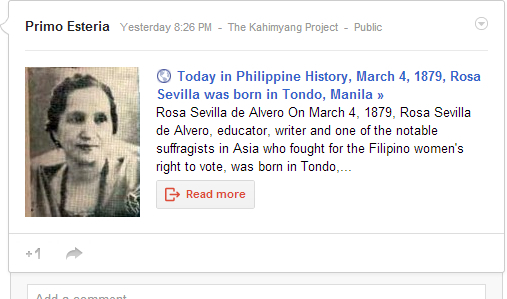 It will share interactive post, this page, to your G+ stream.